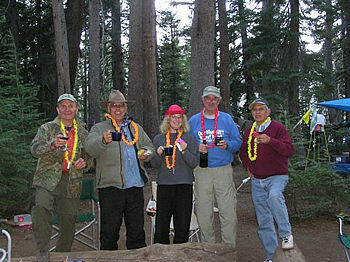 After a one year hiatus in 2003, the annual Mike Pinelli-led post Labor Day horseback trip to the high Sierras resumed in September 2004. (For the uninformed, this is a perfectly horrible, poorly led, no-fun-at-all trip that is continued each year merely to humor Mike.) This year the participants, in addition to Mike, were Debbie Lamica, Rich Holubek, John Files, Oscar Guzman and Homer Eaton. 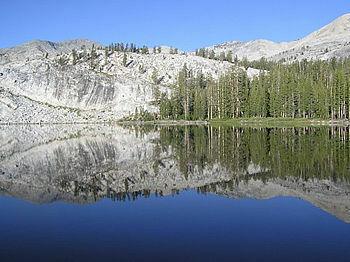 The destination, as in several years past, was Lillian Lake, which is in the Ansel Adams Wilderness, just south of Yosemite National Park, at an elevation of about 8,600 feet. Since we would be four nights camping, with no Safeways or Seven-Elevens handy, a good deal of planning was required to insure that the right supplies were brought by the right people - amazingly, that happened! We left home in three well loaded vehicles the morning of Tuesday, September 7, and spent the night in the Oakhurst Lodge in Oakhurst, which is near Bass Lake. From there, early Wednesday morning, we had an hour and a half drive to the Minarets Pack Station, where our gear was loaded on mules, our horses assigned, and the 12 mile ride to Lillian Lake started. It's about a 3 � hour ride, and we arrived mid afternoon with just enough time to get camp set up, a bottle of wine opened, and dinner prepared. Homer scores from his tube. Our camp site was close to the lake's edge, in the trees, and had enough level space for tents and a good fire pit. The setting is absolutely gorgeous and very photogenic. Lillian Lake is rectangular, about forty acres in size, and, except for one side which has a sheer granite cliff, its shoreline is walkable. 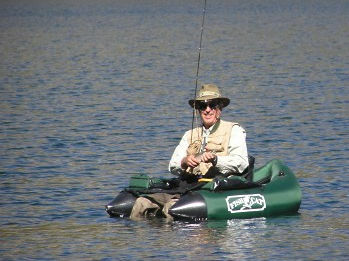 Float tubes are the preferred fishing mode, however, and they were well used on this trip. Everyone caught fish every day - - - mostly, if not all, rainbows in the 6 to 9 inch range. (There was one notable exception, to be elaborated on later!) We fished primarily with small dry flies: Royal Coachmen, Humpies, Elk Hair Caddis, etc. Size 18 to 20 nymphs fished on a sinking line with a slow retrieve also worked well. The fish were always hungry, so one just had to find a stream outlet or inlet, a sunken log or other structure, and something good usually happened. On Thursday, our first full day there, we all fished Lillian Lake. On Friday, John, Rich and Debbie went on a day hike to a couple of small lakes – Flat and Monument Lakes – north of Lillian with modest success. On Saturday, another group of us hiked south to Vanderburgh Lake, where the fish, for the most part still in the 6 to 9 inch range, were literally fighting to get at our flies. The notable exception was Debbie, who hooked into and landed a beautiful 16" rainbow - she was top rod for the trip! Fortunately or unfortunately, the fish swallowed the fly, so it was kept and served as an appetizer that evening. The food couldn't have been better. 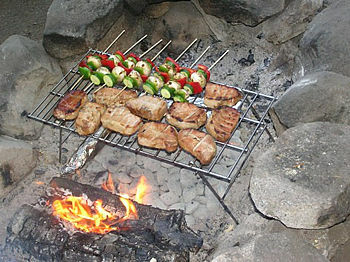 Part of the trip planning was pairing off the six of us, with each pair bringing and preparing one dinner. All the dinners were great. Food for breakfast and lunch was purchased by Mike and Oscar, and individually fixed, except that Mike usually created something special for breakfast. As one can imagine, for the fourth dinner (Saturday), we had enough wine and leftovers for a feast. Oh yes, one of the guys on the trip (the really old one, who shall remain anonymous) celebrated a major birthday while we were there. 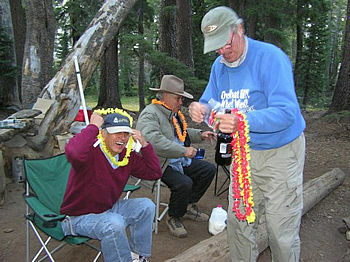 We celebrated with paper leis, little paper umbrellas and a bottle of reasonably good Port, which didn't last too long! Sunday morning came way too quickly. We broke camp right after breakfast, the packers arrived and had us packed up by noon, we were back at the pack station by 4:00 pm, had dinner in Oakhurst, and arrived home (very tired!) by about midnight. We were blessed with beautiful sunny weather for the entire trip. Nights were chilly, but without frost. The location is gorgeous, Mike's planning is great, the ride in and out is not difficult, the fishing was wonderful, and the company and comradeship were even better than that. We wouldn't want the word to get out, but it really is one of the best trips of the year!